106 Plus Years of History! John McKay was the very first person to manufacture table pads for dining room tables. He began manufacturing McKay table pads on January 1, 1911. The company's current president, Steven McKay, is the 4th generation family member to run the business. The company began in Minneapolis, Minnesota and later moved to Saint Paul, Minnesota. McKay built its own 11,000 square foot office building headquarters in January 1998 in the Saint Paul suburb of Oakdale. An interesting fact is that our family at one time had common ownership with the family that started the Ohio Table Pad Company. The founder's brother left Minnesota and moved to Toledo and set up Ohio Table Pads. Common ownership was dissolved many years ago and Ohio Table Pad went out of business in 2015. McKay Custom Products is the oldest and the largest table pad manufacturer. The company has grown its market share through internal expansion and acquisitions. Over the years the company has purchased Heat Proof Table Mat (St. Louis, MO), Acme Table Pad (Denver, CO), Stenzler Table Pad (Dallas, TX), Surpass Table Pad (Chicago, IL), Artex-Green of Chicago (Chicago, IL), J. Marie Martin Co. (San Francisco, CA), Artex-Green New York (Brooklyn, NY) and Hylo Table Pad (Pasadena, CA). The company's manufacturing plant is located in Miami, Oklahoma. McKay is the owner and sole occupant of the building. Our building is a modern industrial building located in a city owned industrial park and is 22,000 square feet in size. 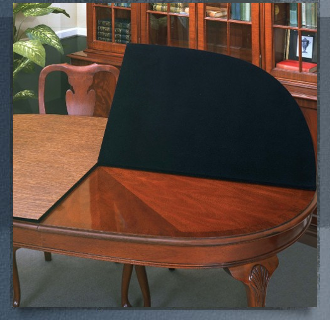 McKay's table pads are American made using American materials! An interesting historical fact about table pads is that back in the 1911 to 1929 era, table pads were a stocked item sold in department stores. At that time, when almost all tables were round, stores stocked 42, 48, 54 and 60 inch round table pads. Just as Henry Ford's Model T came only in black, table pads came only in white with a green base. As table manufacturers began to make oval and shaped tables of all shapes and sizes, table pads became the custom made product that we know today. Another odd fact is that the company made small electrical fans for the war effort during World War II. Some historical events from the year 1911: The very 1st Indianapolis 500 was run with an average speed of 74 miles per hour. IBM was incorporated. Machu Piccu was rediscoved by American archaeologist Hiram Bingham. Norwegian explorer Roald Amundsen became the 1st person to reach the South Pole. Robert Scott's 1911-1912 expedition reached the South Pole in January 1912 and he and his companions perished on the return journey from the Pole. The RMS Titanic was launched on May 31, 1911 in Belfast, Ireland. (She sank on April 15, 1912.) The US Army introduced the famous M1911 Pistol designed by John Browning. Lucille Ball of I Love Lucy fame was born. Vice President of the United States, United States Senator from Minnesota and presidential nominee Hubert Horatio Humphrey was born. United States President, California Governor and Hollywood movie actor Ronald Wilson Reagan was born.